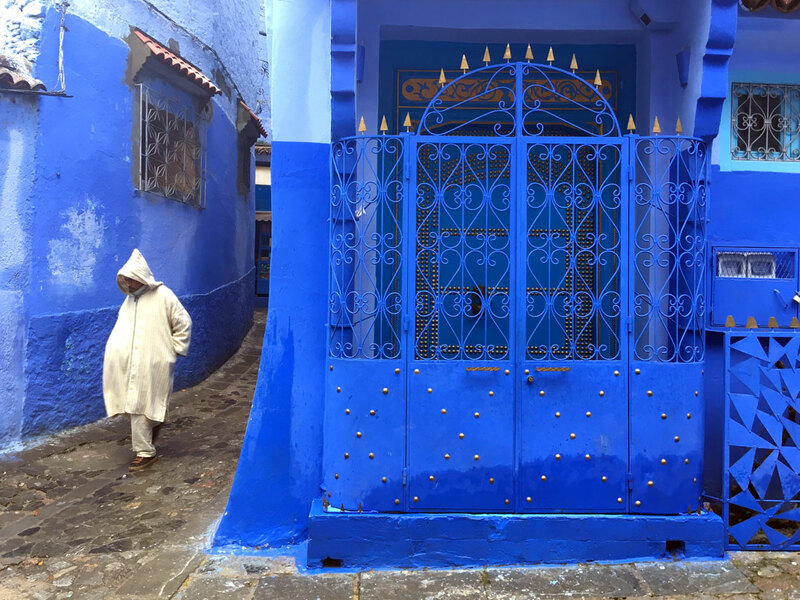 When I first heard of the blue world of Chefchaouen in Northern Morocco, I wondered whether the buildings had been painted that colour as a gimmick to attract tourists. But the truth is far more interesting. After the Jews were expelled from Spain in 1492, some of them settled in Chefchaouen. They brought the colour with them because, in Judaism, it represents the colour of the divine and the sky: the celestial. And although most of the Jewish community in Morocco left for Israel in the late 1950s and ’60s, Chefchaouen remains true blue to this very day. Photographing this environment was an intensely spiritual experience and I felt like I was floating in an infinite blueness, a world without end. I also found myself thinking about the two artists who shared this azure obsession. The first is Yves Klein (1928-1962) who developed and patented International Klein Blue: a dark and saturated shade found throughout Chefchaouen although I suspect this has nothing to do with Klein’s influence. The second artist is Derek Jarman (1942-1994) who, along with me, was one of the participants in “Coming Out, Sexuality, Gender & Identity”, a recent exhibition at the Walker Art Gallery in Liverpool and Birmingham Museums & Art Gallery. He first wanted to make a blue film in 1974 because he was inspired by both International Klein Blue and Yves Klein’s desire to transcend reality so as to reach an immaterial, mystical beyond. Jarman was also a mystical artist and often used religious imagery of tormented beauty and heroic suffering to represent aspects of homosexual identity. Diagnosed with HIV in 1986, he returned to his idea of a blue film idea once he started losing his eyesight and medication caused him to see the world through a dense blue filter. “Blue” was completed in 1993 and Derek Jarman died the following year of AIDS-related complications.